The season finale of 'Dancing with the Stars' came to a close and the competition was tight. In the end, it was Rumer Willis who came out on top. LOS ANGELES -- After 10 weeks, dozens of dances, pounds of glitter and gallons of spray tan, season 20 of "Dancing With The Stars" has a winner! It was a long road for all the contestants, but the victorious couple won over the judges and the fans and now have the gold Mirrorball Trophy to show for it. 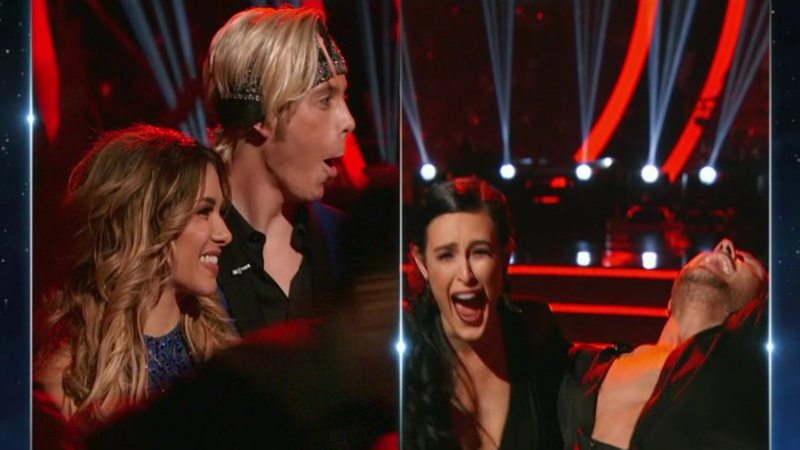 Coming into the final night of competition, both Riker Lynch and Rumer Willis were tied in the judge's eyes, after both couples received perfect scores for both dances. Noah Galloway was right behind, but there was one more dance still to do! All three couples were given 24 hours to come up with a routine that blended together two contrasting dances styles. This season of "Dancing With The Stars" is now in the history books. Noah and Sharna Burgess' dance mash-up included the Cha Cha and the Argentine Tango. The couple was very reflective when they realized they were putting together their very last routine. Sharna told Noah every moment on the dance floor with him had been "epic." The judges were just as complimentary. Len Goodman told Noah he's given so much to America, why shouldn't he get the Mirrorball? Julianne Hough called him the heart of the competition. Bruno Tonioli said he was one of the most inspiring people he'd ever met. Carrie Ann Inaba told both Bruno and Sharna they had changed people's lives. Riker and Allison Holker are completely exhausted, but push through one more, very long rehearsal session to put together a Salsa/Quickstep fusion dance. His goal was to have fun with his new good friend just one more time, and they did. Julianne told them she couldn't believe they put the routine together in just 24 hours. Bruno thinks Riker is a unique talent with incredible range and a powerhouse performer. Carrie Ann called him a superstar. Len said he is the boy who brings him joy. The dance Gods gave this dynamic duo the blend of Foxtrot and Paso Doble. Rumer said she is a changed person from three months ago, and while she knows she sounds like a broken record, she again lets us know that this had been the best experience of her life. Val told her how proud he is of all she's accomplished. Bruno loved the way dance has transformed Rumer, and he called her utterly irresistible. Carrie Ann concurred, calling her the real deal on the dance floor. Len went even further, saying she's as good as anyone who's ever been on this show. Julianne said she was about to "girl fan" out and she can't wait to see what happens from now on in her career. 'Dancing with the Stars' closed the stage Tuesday night, and ended with Rumer Willis and Val Chermkovskiy taking home the coveted mirror ball trophy! Now, on to the final results. Queue the drumroll please! Noah and Sharna were the first couple eliminated, earning third place for the season. That left Rumer and Val and Riker and Allison. And the winner of season 20 of "Dancing With The Stars" is Rumer and Val! Congratulations!